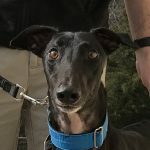 Ed Red – a Greyt GFNC Adoption! Well, it’s been two months now, and Red is letting his real personality shine through. He just loves to run and play in the back yard, and even though he is still a bit of a velcro hound, he is starting to not be so attached as he was at first. He loves to show off for us, rolling around squeking his toys and then flipping onto his back and looking at us and smiling. His puppyhood is showing now, and will for a few more months. We were sitting at the picnic table tonight, and he was laying in the grass, when all of a sudden he grabbed his rubber steak and took off running! He made about two laps of the area and dropped his steak, laid back down in almost the exact same spot and looked at us and smiled. Yepper, we picked a winner!